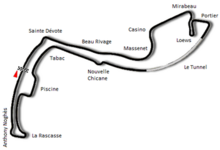 The 1996 Monaco Grand Prix (formally the LIV Grand Prix Automobile de Monaco) was a Formula One motor race held at Monaco on 19 May 1996. It was the sixth race of the 1996 Formula One season. The race was run in wet weather, causing significant attrition and setting a record for the fewest cars (three) to be running at the end of a Grand Prix race. Olivier Panis scored his sole career Formula One victory, earning the last ever Formula One victory for the Ligier team, and the first ever for engine manufacturer Mugen Motorsports, after switching to slick tyres in a well-timed pitstop. Johnny Herbert scored his only points of the season. Michael Schumacher had taken pole position but had caused controversy on his slowing down lap when he impeded Gerhard Berger right at the end of the session. Coming out of the tunnel Schumacher was cruising slowly, acknowledging the crowd, while Berger was on a fast lap. Schumacher tried to get out of Berger's way but the Austrian had to spin at high speed to avoid the Ferrari, entering the chicane backwards. The Ligiers were 14th and 17th in qualifying, both below their expectations after the team had mis-firing issues, preventing a top six position. Olivier Panis was fastest in the warm-up. Jacques Villeneuve was 18th after running a wet-setup in preparation for the expected rain. Between the warm-up session and the race, heavy rain fell at the circuit. An additional 15-minute session was added to allow the drivers to get used to the changed conditions as it was the first time rain had fallen over the race weekend. The session took place at 13:15 CEST (GMT +2). Several drivers went off during the session, including Pedro Lamy, Pedro Diniz and Giancarlo Fisichella, but all continued. The only two drivers to escape with damage were Mika Häkkinen and Andrea Montermini. Jean Alesi suffered a puncture at the end of the session, but was able to return to the pitlane. Several drivers opted to skip the session. The Footwork team chose not to participate as they did not have any spare parts, and any crash would have marked the end of their weekend. Häkkinen was fastest, setting his time before his crash, with Alesi, Rubens Barrichello and Johnny Herbert behind. The two Williams cars were 7th and 8th, Villeneuve ahead of Damon Hill with Schumacher behind them in 9th. The race started at 14:30 CEST. In the warm-up Montermini crashed his Forti coming out of the tunnel, and the team's lack of a spare car meant the Italian was unable to start the wet race, therefore 21 cars would take the start. Hill got the jump on Schumacher into Ste Devote while further back there was trouble already. Jos Verstappen, who had opted to start the race on slicks, slid straight into the wall. The two Minardis were then eliminated when they tangled coming out of the first corner. And so 18 cars climbed the hill on the first lap. Hill began to pull away while polesitter Schumacher lost control coming out of Lower Mirabeau and hit the wall, leaving 17 cars running. Coming into the Rascasse, Barrichello's race was over as he spun. After five laps, there were only 13 cars remaining as Ukyo Katayama (accident), Ricardo Rosset (accident) and Diniz (transmission) joined the list of retirements. A significant gap began to open between the leaders and Eddie Irvine in fourth. Indeed, there was a queue of eight cars behind the slow Ferrari. Berger retired from third place on the 10th lap with gearbox trouble leaving 12 cars while Heinz-Harald Frentzen damaged his front wing trying to pass Irvine, dropping to second last, ahead of Luca Badoer. On lap 31, Martin Brundle spun off, which left only 11 cars in the race. Three laps later, Irvine was eventually passed when Panis forced his way through at the Loews hairpin in an electrifying move. Irvine lost control, became stuck and had even undone his seatbelts before he restarted his car with the assistance of the marshals. Hill, meanwhile, had briefly lost the lead to Alesi when he made a pit stop on lap 30 to change to slicks as the track began to dry, but regained the lead a lap later when he overtook the Frenchman (who was still on wet tyres) on the track. Alesi made his pit stop shortly afterwards, allowing Hill to extend his lead to nearly 30 seconds and continue untroubled at the front until the 40th lap, when a failed oil pump caused his engine to blow coming out of the tunnel, his first retirement of the season. Alesi took over the lead after otherwise having a quiet race in second. He lasted 20 laps in the lead when his suspension failed, handing the lead to Panis. Luca Badoer was running six laps down in the Forti when he collided with Villeneuve at Mirabeau on lap 66, retiring both drivers. The race did not run its full distance as the 2 hour time limit came into effect. Panis was leading David Coulthard by a small margin with only five other cars behind them. Irvine capped an eventful afternoon by spinning at the same point that teammate Schumacher crashed. As he tried to rejoin, he was hit by Mika Salo, who was in turn hit by Häkkinen. All three cars retired, leaving only four cars circulating, with Frentzen running last. The German, who so easily could have been leading the race, decided to pull into the pits on the penultimate lap as he was running last anyway, and everyone else had already seen the checkered flag. Therefore, only Panis, Coulthard and Herbert were counted as finishing the race (even though Frentzen was the last car still circulating on track), with the Frenchman winning his one and only Grand Prix and Ligier's first win in 15 seasons. Frentzen, Salo and Häkkinen were classified in the final points positions with Irvine credited with seventh place. ^ Edwards, Ben (Commentator) (1996-05-19). Monaco Grand Prix: Acclimatisation Session Live (Television production). London, England: Eurosport. Event occurs at 08:25 (excluding commercials). ^ Edwards, Ben (Commentator) (1996-05-19). Monaco Grand Prix: Acclimatisation Session Live (Television production). London, England: Eurosport. Event occurs at 08:05 (excluding commercials). ^ Edwards, Ben; Watson, John (Commentators) (1996-05-19). Monaco Grand Prix: Acclimatisation Session Live (Television production). London, England: Eurosport. Event occurs at 01:00–01:20 (excluding commercials). ^ Edwards, Ben (Commentator) (1996-05-19). Monaco Grand Prix: Acclimatisation Session Live (Television production). London, England: Eurosport. Event occurs at 00:00–00:05. ^ Edwards, Ben (Commentator) (1996-05-19). Monaco Grand Prix: Acclimatisation Session Live (Television production). London, England: Eurosport. Event occurs at 00:57. ^ Edwards, Ben (Commentator) (1996-05-19). Monaco Grand Prix: Acclimatisation Session Live (Television production). London, England: Eurosport. Event occurs at 02:10–02:15. ^ Edwards, Ben (Commentator) (1996-05-19). Monaco Grand Prix: Acclimatisation Session Live (Television production). London, England: Eurosport. Event occurs at 15:37. ^ Monaco Grand Prix: Acclimatisation Session Live (Television production). London, England: Eurosport. 1996-05-19. Event occurs at 05:00. ^ Monaco Grand Prix: Acclimatisation Session Live (Television production). London, England: Eurosport. 1996-05-19. Event occurs at 07:30. ^ Monaco Grand Prix: Acclimatisation Session Live (Television production). London, England: Eurosport. 1996-05-19. Event occurs at 12:45. ^ Monaco Grand Prix: Acclimatisation Session Live (Television production). London, England: Eurosport. 1996-05-19. Event occurs at 13:45. ^ Monaco Grand Prix: Acclimatisation Session Live (Television production). London, England: Eurosport. 1996-05-19. Event occurs at 15:56. ^ Monaco Grand Prix: Acclimatisation Session Live (Television production). London, England: Eurosport. 1996-05-19. Event occurs at 16:56–19:00. ^ Watson, John (Commentator) (1996-05-19). Monaco Grand Prix: Acclimatisation Session Live (Television production). London, England: Eurosport. Event occurs at 18:45. ^ Monaco Grand Prix: Acclimatisation Session Live (Television production). London, England: Eurosport. 1996-05-19. Event occurs at 19:47. ^ Edwards, Ben (Commentator) (1996-05-19). Monaco Grand Prix: Acclimatisation Session Live (Television production). London, England: Eurosport. Event occurs at 00:40. ^ "Monaco 1996 – Qualifications". statsf1.com. Retrieved 4 November 2018. ^ "1996 Monaco Grand Prix". formula1.com. Archived from the original on 1 November 2014. Retrieved 24 December 2015. ^ a b "Monaco 1996 - Championship • STATS F1". www.statsf1.com. Retrieved 19 March 2019.